The Western Library Reading Series presents a free reading by Carol V. Davis from her new book, Between Storms. The event will take place at the Library Skybridge, Wilson Library, Western Washington University, Bellingham, at 4:00pm on Tuesday, April 3, 2012. In addition to Between Storms (Truman State University Press, 2012), Carol V. Davis won the 2007 T.S. Eliot Prize for Into the Arms of Pushkin: Poems of St. Petersburg. Her other books are It’s Time to Talk About… (bilingual Russian/English, 1997) and two chapbooks, Letters From Prague and The Violin Teacher. Twice a Fulbright scholar in Russia, she was the 2008 poet-in-residence at Olivet College, Michigan, and teaches at Santa Monica College, California. Her poetry has been read on NPR and Radio Russia and has appeared in such journals as Ploughshares, Prairie Schooner, Natural Bridge, Crab Orchard Review, Mid-American Review, Hayden’s Ferry Review and in anthologies including New Poets of the American West (2010), Mamas and Papas (2010), Lavandaria: Women, Wash and Words (2009), etc. She read at the Library of Congress in November 2010 and in August 2011 was (the first) poet-in-residence at Homestead National Monument of America in Nebraska. The deadline looms. You wait till the pressure becomes intolerable. It’s time, poets. Get it together. Check the guidelines and submit your poem. Of course we’re talking about the Sue Boynton Poetry Contest (poems must be received by 5:00pm tomorrow, Saturday, March 31, 2012), but there’s more! Crab Creek Review, the Seattle-based print journal. The Postcard Press, a micropress publishing one very short story or poem each month in the form of a 4″ x 6″ postcard. Theme for this issue: lies I almost believe. Want more literary publication deadlines? Have a look at the theme and deadline calendar on Duotrope. We’ve happened across another: Oaken Transformations Sculpture and Poetry Walk in Brighton, Michigan. 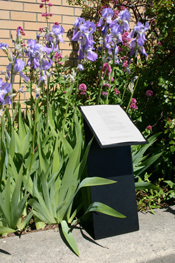 The half-mile trail features sculptures on one-year consignment and poems, by Michigan poets, permanently installed. Visit the project website to learn more or find Oaken Transformations on Facebook. WAIT! Don’t mail that poem! If you haven’t mailed your poem yet, please don’t take a chance of missing the deadline — 5:00pm, Saturday, March 31, 2012. All poems must be received by that time. Mail delivery is slower these days, but you still have time to hand deliver your poem to Mindport Exhibits, 210 W. Holly Street, in downtown Bellingham. Mindport is open Wednesday, Thursday and Friday from Noon to 5:00pm and Saturday from 10:00am to 5:00pm. We look forward to reading your poem! Last week, writer Craig Morgan Teicher discussed the efforts by Port Townsend-based poetry publisher, Copper Canyon Press, to adapt poetry for hand-held devices. In his Publishers Weekly article, Fitting Poetry to the Screen, Teicher describes the challenges of fitting long lines onto narrow screens with suitable line breaks while still honoring the poet’s intent. The story was also covered in Harriet, the blog of the Poetry Foundation. Once you’ve turned in your poem for the Sue Boynton Poetry Contest, what will you do with all that free time?